Group portrait Tall Cedars of Lebanon, Richmond Forest No. 66 Band. Albumen (possibly GSP) print, mounted on large format decorative cabinet card. 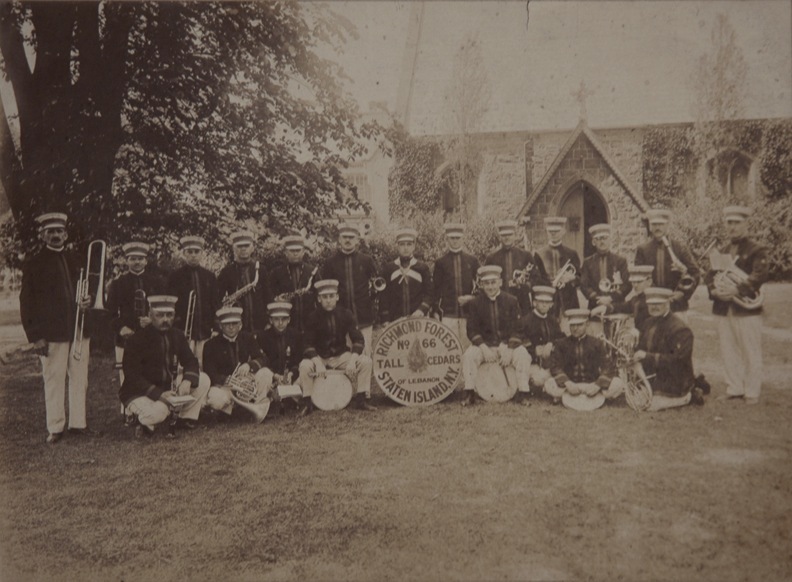 22 men in two rows, variously standing, sitting, kneeling, all in smart marching band uniforms, light pants, dark jackets with stripes down front and at sleeves, and military dress style caps. Each of the men has an instrument, mostly brass instruments, as well as some drums and other percussion..
Of particular note is that the men are not wearing Pyramids. This presents a particular problem. Date for this photo is based on the official history of TCL, which states that Forest 66 was chartered in 1921. However, the photo has an aspect of being somewhat older than this. 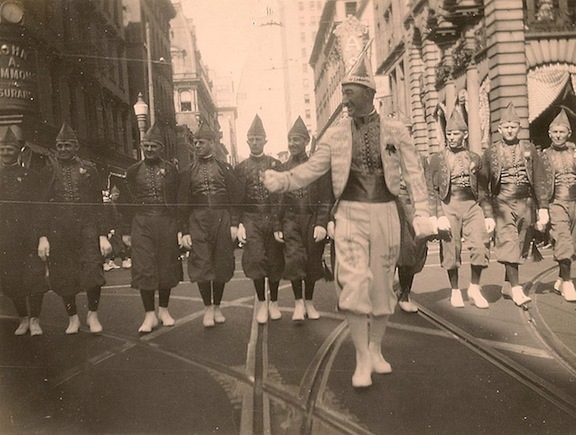 Also, the Pyramid was officially adopted in 1912, and it is odd that these men are not wearing them. Worth research. 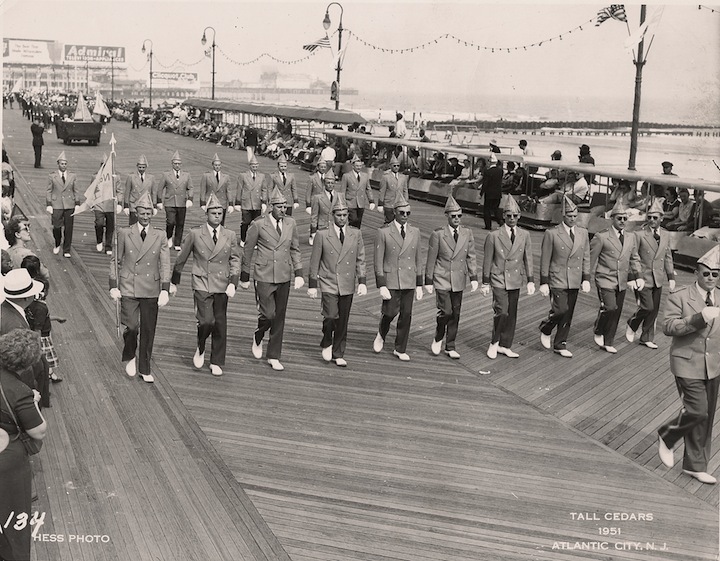 Marching formations of TCL members from Atlantic City Forrest #34 parading on the boardwalk of Atlantic City. They all wear light jackets, dark pants, and white gloves and shoes. Left forward, a man carries a flag or banner with a cedar tree finial. Name of the Forrest is visible on several of the men’s pyramids. Crowds line the walk. In the distance can be seen a parade float and further marching groups of Cedars. 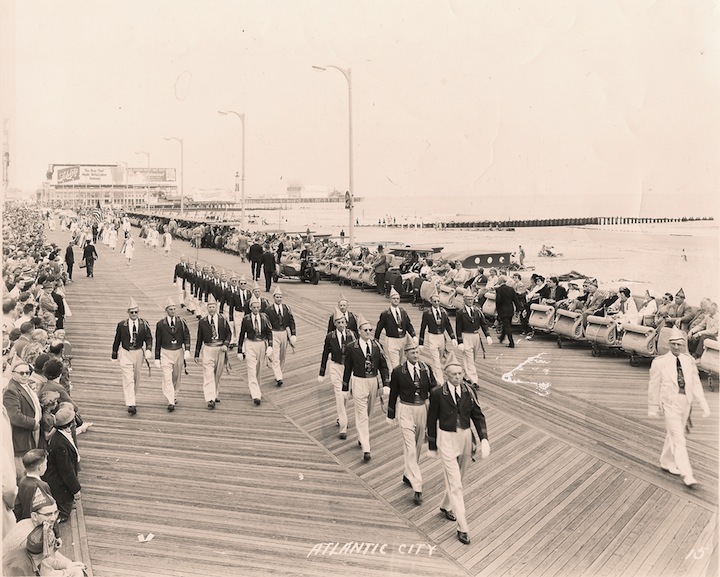 Marching formations of TCL members parading in cross formation on the boardwalk of Atlantic City. They all wear dark jackets and neckties, light pants, and white gloves and dark shoes. A man in a white suit and pyramid, right. In the distance can be seen further paraders. Marked LC into the negative is “Atlantic City” and LR is a photographer’s number “15”. From a lot of 13 snapshots of a Tall Cedars of Lebanon parade and its participants. 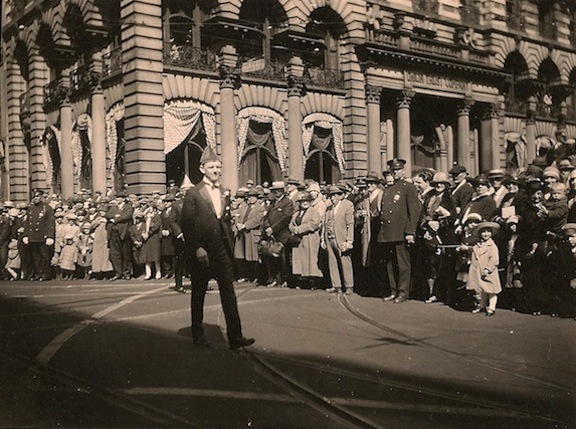 Date based on cars in images, location verified by Union Trust Building seen in image. Man in tuxedo and TCL pyramid, parading alone past Union Trust Building, Providence, RI. 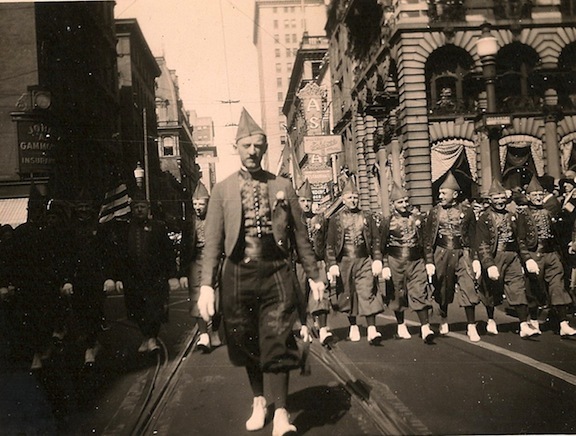 Tall Cedars in Zouave-style parade uniforms. 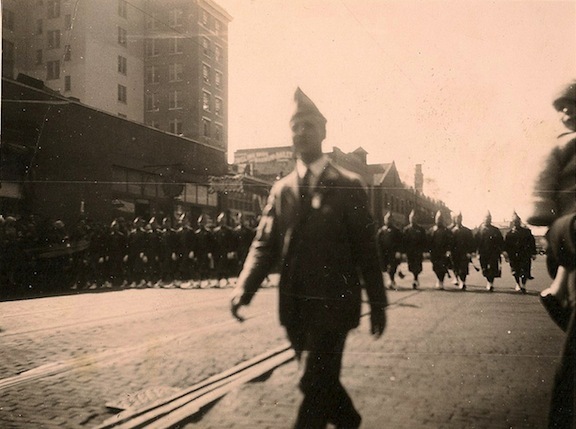 One Tall Cedar leads out in front, with a line of at least a dozen more in similar parade uniforms following behind. They appear to be marching pretty well in step, and seemingly enjoying themselves. Tall Cedars in Zouave-style parade uniforms. Leading the way is a man in a white uniform and white pyramid, marking him as an officer or unit head. From a lot of 13 snapshots of a Tall Cedars of Lebanon parade and its participants. Tall Cedar in dark suit. Behind him is a phalanx of Tall Cedars in Zouave-style parade uniforms. This is probably the most painterly of the 13 snaps in this group.